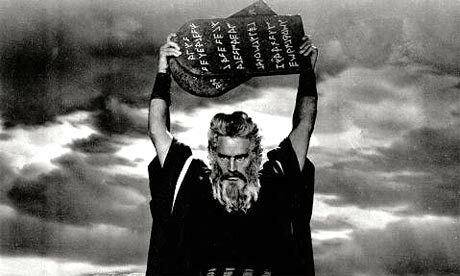 Heston, as Moses in The Ten Commandments. People’s reactions to some events just scream for a little analysis, especially the reactions we find within ourselves. You can believe what you want, but whether you believe it comes from random Nature or from God, we are certainly programmed to be engaged in a daily battle between instinct and civilization’s definitions of good behavior. The story makes a guy like me think pretty hard about his own mental clockworks. I’m against killing. I’m against abortion, and, unlike many paradoxical thinkers who claim to be moral and even Christian, I’m against the death penalty, too. I don’t believe humans have the right to determine when another human should die -- or, if we’re splitting hairs, when they should be allowed to come alive. I don’t believe killing is ever moral, not in war and not in self-defense. I have, however, said before that know I would kill to protect my family, if necessary. I still wouldn’t argue, afterward, that killing their attacker was moral act. I might call it an act (a sin, if you will) that needed to be committed for the preservation of my loved ones. But my moral code tells me that killing is always bad. But here’s the conundrum: My mind says killing is wrong; however, my heart leaped for joy when I read the article about this dad killing his daughter’s attacker with his bare hands. In fact, I could almost feel my reptilian brain kicking in when I read the article; I could feel violence rising in my blood. Like everyone else, I want to be refined. I want to be fair. I want to be gentle. I want to be civilized. But, God forgive me, something about the death of that girl’s attacker at her father’s hands feels so right to me. It feels as close to righteousness as anything I have even seen. It feels almost beautiful -- almost poetic. Call this a confession, if you want. I’m wrong to feel this way, right? Is Truth a feeling or an idea? Lavaca County Sheriff Micah Harmon said he found the distraught father crying, saying that he had not intended to kill Flores. Had Nature told this man what was the "right" thing to do at the time? Had years of social, moral and religious conditioning made him lament having done the "right" thing? Does the message of what's right still apply when our instincts deliver us into other temptations? -- like whether or not to cave-in to sexual desire? Sometimes I wish I could be one of those grinning dopes who thinks life is simple.